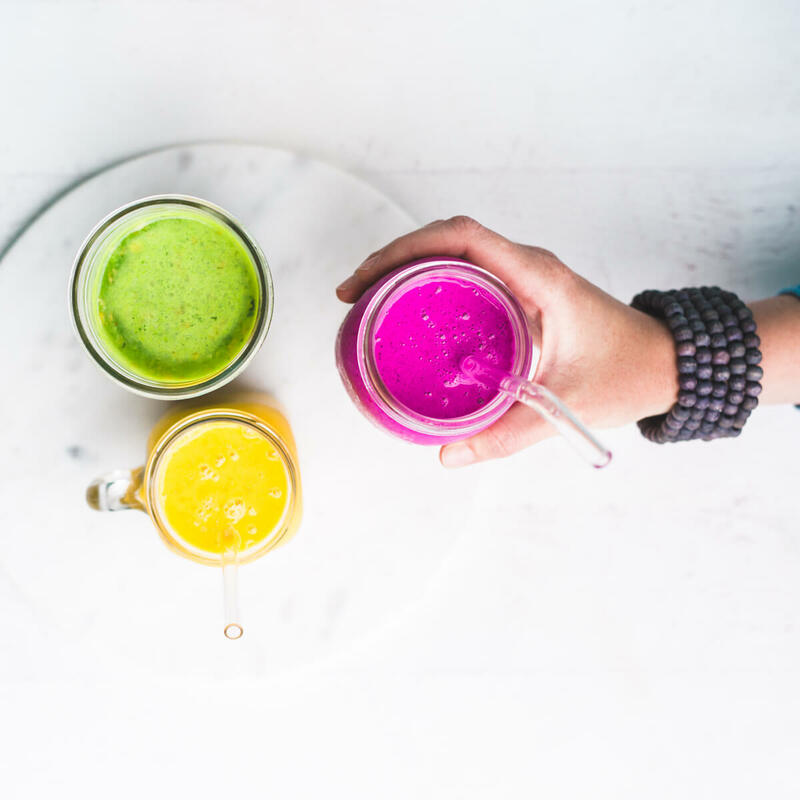 Because during menopause you have such an increased need for certain micronutrients that it’s almost impossible to get enough of them without using superfoods. But what are superfoods for menopause? What’s the difference between foods and superfoods? Find out how the lignans in flax seeds help regulate hormones, how flax seeds help build progesterone, and what common foods and superfoods, because they contain lignans, are part of the perfect diet for menopause. Then my best hormone-balancing tips delivered straight to your email inbox! 7:35 Are flaxseeds safe for everyone? 7:35 Is flaxseed safe for everyone? Want to hang out with hundreds of other women going through the same thing?? Sometimes you'd rather read than watch - I get it! If you’ve ever wondered - are superfoods important during menopause? And if so - which ones are the best to use - and are they safe for everyone? Stick around because that's exactly what we’re covering in today’s video. Hi! I’m, Dana LaVoie - Acupuncturist & Herbalist, and founder of Menopause Basics - and for 15 years I've been helping women use natural remedies to balance hormones so they can have an easy menopause and feel great afterwards. And today we’re talking about superfoods for menopause - and specifically my #1 favorite superfood for menopause! At the end of this video I’m going to invite you to sign up for a FREE copy of my Menopausal Woman’s ROADMAP so you can learn five easy to follow steps about the most important things to eat everyday for hormonal health. I’ll give you more details on that later, but right now, let’s get started! As I’ve worked with women in menopause for 15 years I've discovered that the #1 thing women can do to ease menopause symptoms and protect their health afterwards - is to include the right foods & superfoods in their diet. Why is this important? What’s the difference between foods & superfoods? And why are some superfoods great for menopause while others are no help at all? Well, from the time you hit puberty until perimenopause - like during your fertile years when you’re having your regular monthly cycle- your body is adjusting your hormones each month. About four big adjustments a month but your overall hormone levels stay about the same, right. So, I call this high premenopausal normal hormone levels. During perimenopause you’re still having your cycle but at the same time your hormone levels are changing and dropping. Then during menopause - your body is adjusting to not having a cycle - and your hormones levels are still changing and dropping -- changing a lot and trying to find a new balance at a lower hormone level towards the end of menopause. So basically - before menopause your body was adjusting hormone levels in a significant way like about four times a month, this isn’t the exact number but it gives you an idea. So four times a month and then during menopause and perimenopause it’s adjusting them like eight times a day! Okay, so the numbers aren’t exact- but it’s like the difference between trying to balance on a surfboard that’s on a beach, and trying to balance on a surfboard that’s on a wave. Okay, so your body working a lot harder to keep hormones in balance while changing during menopause and it’s having to make adjustments a lot more often and a lot faster. So, say each time your body adjusts those hormone levels - it has to build a few new hormones and put them in place - like building a brick wall and adding 10 new bricks to a gap in the wall. Say that’s one after the adjustments. So, for many years, before menopause, your body needed to put in 10 new bricks four times a month. Well now your body needs to put in 10 new bricks eight times a day!! So during menopause - your body needs to have MORE BRICKS available - and by bricks I mean the building blocks your body uses to make hormones - it needs to have LOT MORE of those available at all times. And this is where the superfoods come in. So you get the main nutrients your body needs to make things like hormones from food. And you have to have healthy foods in your diet, right like a wide variety of healthy foods. But when your body is trying to build hormones - it needs certain special building blocks. Giving you these building blocks is how flax seeds can help balance hormones during menopause. For instance - there’s something called lignans that you can get in your diet - that is a great building block for hormones. Common foods that contain lignans are broccoli, curly kale, apricots, and sesame seeds. Things that you are likely to have in your normal diet. Broccoli has 0.6 mg lignans per 1/2 cup, kale - 0.8 milligrams, apricots 0.4 mg , and sesame seeds one of the highest foods in lignans - has 11.2 mg lignans in 1 oz. So during your fertile years - when you need 10 hormone building blocks four times a month - this’ll likely be enough. But during menopause when you need 10 bricks 8 times a day - you could NEVER eat that many cups of broccoli and kale or that many oz. of sesame seeds to get that many times more lignans in your diet, it’s not going to happen. And this is where menopause superfoods come in. Because when you want much higher than average, much higher average sources of very specific micronutrients, that’s what superfoods are for and how flax seeds can balance hormones. During menopause you have such an increased need for certain micronutrients, that is almost impossible to get enough without using superfoods. So for menopause - I recommend flax seeds. Flax seeds contain 85.5 mg of lignans in every one ounce serving! So we are talking about foods you’re eaten before like having 0.4 mg.per serving and these have 85.5 miligrams per serving. So that gives you a lot more, like the difference between, you know, what was it, like 10 blocks-10 bricks four times a month and 10 bricks eight times a day. That’s the kind of difference that flax seeds can make in terms of hormonal building blocks in your diet. So I recommend flax seeds for menopause and perimenopause. Flax seeds have other health benefits. So you should also know that in addition to studies showing that flax seeds can reduce occurrence and intensity of hot flashes by about 50%, flax seeds are also thought to promote breast health, provide cardiovascular support, and support healthy glucose metabolism - which helps reduce the risk of diabetes and insulin sensitivity - and helps support maintaining a healthy weight . And flax seeds also give antioxidant and anti-inflammatory support! So they have a LOT of health benefits. And now I want to give you my tips on how to use flax seeds and how to use them in the safest way possible. So I recommend using flax seeds fresh ground. If you want to grind them right before you eat them - and you can do this with a high powered blender or a countertop coffee grinder, which is pretty inexpensive. And flaxseed oil does not contain lignans that’s in the solid part of the flaxseed so it doesn’t get into the oil. So, unless the flax oil is actually combined with ground flaxseeds that’s not the best source of lignans. And if you grind them the way ahead of time flax goes runs at a very very quickly and easily. So you want to keep it as a whole seed until just a little bit before you eat it is the best way to use them . I like to use 2 tablespoon of flaxseeds a day, fresh grounds, and I find that using this way - as a food - is the safest way to use them compared to using them in a supplement form. 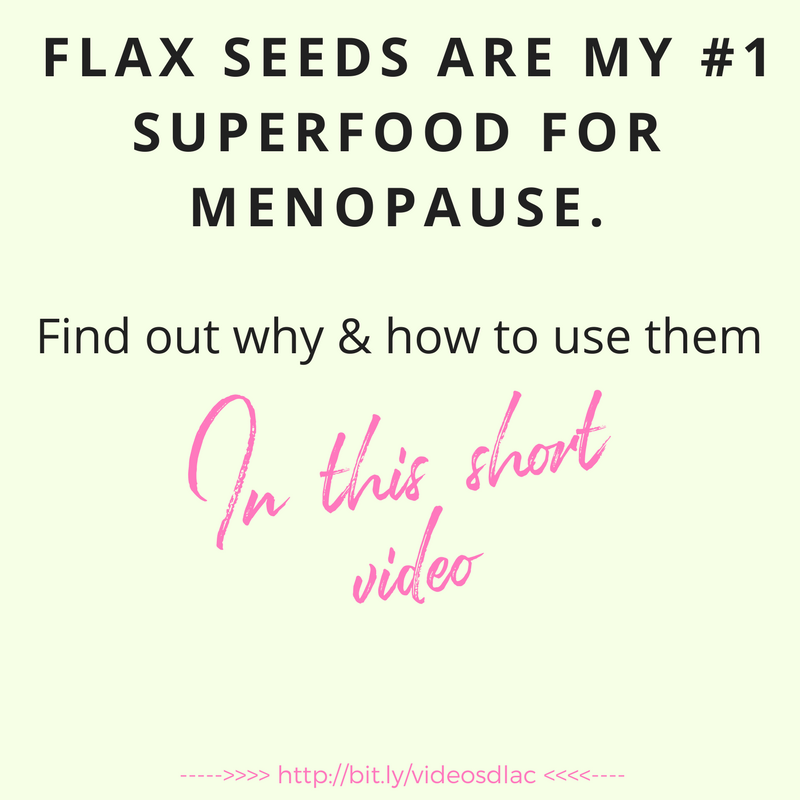 Flax seeds are my #1 superfood for menopause. Find out why & how to use them in this short video. Are they safe for everyone? So the lignans in flax seeds are high in their phytoestrogen - and researchers at this point not completely sure if those type of phytoestrogens are safe for women with estrogen dominance or a history of estrogen mediated cancers or for pregnant or lactating women. Now a lot of research had shown, and a lot of doctors that I greatly respect, feel that the phytoestrogens in flax seeds may actually be helpful in protecting against preventing estrogen related disease.But we’re not sure, so if you have that kind of a history then you should check with your healthcare practitioner. I’m also putting a link below this video to another video that I have done on how to use estrogen rich foods safely - and so all my best tips for using flax seeds in the best possible way are in that video. It’s really a good one. A healthy diet is step #1 for hormonal health but during menopause using a menopause superfood like flax seeds is important because you have such an increased need for very specific hormonal building blocks - and you’d never get enough just of them from the most common foods. So flax seeds can benefit hormones. Flax seeds have many health benefits - they can help reduce maybe hot flashes and other menopausal symptoms, give support to your heart and cardiovascular health, healthy blood sugar and healthy weight, and provide antioxidant and anti-inflammatory support. They help hormones during perimenpuase and post menopause as well. And the safest way to use them are to use fresh ground whole flax seeds - and to check with your doctor to be absolutely sure that they are good choice for you. If you enjoyed this video, and want to get started - I invite you to click the link below to sign up for your free copy of my Menopausal Woman’s Roadmap. This free download will give you FIVE easy to follow steps on the most important things to eat every day, to get you relief from hot flash symptoms by giving your body all the building blocks needs to make hormones. And it’ll show you the top THREE mistakes women make during menopause and just how to fix them. I’m also the host of a Facebook group Menopause Basics - and all the best discussions about these videos happen in that group. So if you have questions, and want to continue this conversation, use the link below in this video to join the Facebook group and I’ll see you there. Pop your comments in there, let’s have a conversation. I’m Dana LaVoie - an Acupuncturist, Herbalist, & founder of Menopause Basics, thank you so much for watching today. Oh, also be sure to share this video with your friends and sisters who could use this information and I’ll see you next time. Hi, I'm Dana, an Acupuncturist, Herbalist, & founder of Menopause Basics. For 15 years I've been helping women use effective natural remedies to get relief from menopause symptoms and feel great afterwards. It's my passion! My secret? Start with including the right foods in your diet. Get the building blocks your body needs to balance hormones and keep you healthy. Every other menopausal remedy works better with this foundation in place. Here's what it takes: It's not a diet.. CLICK HERE to learn what to eat every day to supply your body with the building blocks it needs for healthy hormones & anti-aging in my FREE guide. Hi, I'm Dana, a Senior Tonic Herbalist devoted to helping women find the secrets to balancing their hormones naturally and spiraling their health upward to new levels. A handy, one-page index of all my free video blogs! Coming Soon · How To Use Chinese Herbs During & After Menopause - the online program! Become an email insider to get an invite to my special intro offer when the course opens!